A fresh and fiendish new fiction series from the master of horror. Whats that you say? Zombies? Yes, please! This is my first Darren Shan novel although I have heard many, MANY amazing things about his Darren Shan and Demonata series, so what better way to introduce me to this author than with one of my favourite things...Zombies! I have to admit that it took me a couple chapters to finally get into this novel. It wasn't until Chapter 7 or so that I was finally getting into the groove of this book. Once that passed, the book picked up to a great pace and the page-turning finally began! 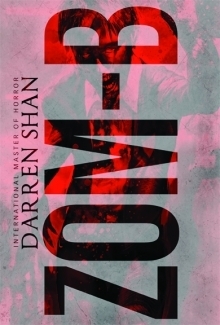 Darren Shan definitely kept with the classic mystery of a zombie book; The creaking noises, the distant sounds, the anticipation that something is going to jump out at any moment just nagging at you. It kept me on the edge of my seat! A little added surprise that I don't experience too often in books were the illustrations. They added to that already dark and creepy visual that Darren Shan penned. It was a great addition! Zom-B was the perfect length. At only 217 pages, it is a short read but ends with you begging for more! Making fans eagerly await it's sequel. Well played Shan, well played! I can definitely see what all the fuss is about with Darren Shan. Zom-B was packed with a simple writing style, a dark and gruesome storyline, and a powerful main character. If you're looking to satisfy your Zombie sweet tooth, than Zom-B is the book for your! I love the Christmas theme on your blog. I've never read Twilight, but usually I've at least heard of some of the characters. I've never heard of Alice.